Introductory courses for parents, educators, pedagogues, therapists and anyone interested in playing with glove puppets. What is the secret of a lively puppet show? How can I make the puppets come alive? What should I do and what should I avoid to ensure a fluent and entertaining performance where improvising comes naturally? These are the questions that the workshop or training course deal with both in theory and in practice. A whole variety of games and exercises will help you to tackle these questions and ensure a fun-packed and enlightening course in the art of puppetry. 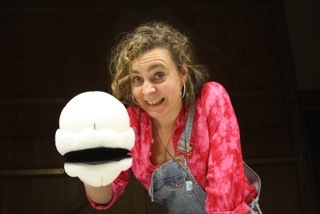 The aim of the workshop to awaken your joy and delight in playing with glove puppets and to give you access to lively and creative playing with them. To register for a workshop, you do not need any prior experience. The emphasis will be on playing with large single glove puppets, which have the advantage that the mouth and the hands can usually be moved separately. There will be a large number of puppets at your disposal at the workshop; and if you wish you can bring along your own puppets too. The workshops are for parents, educators, teachers/pedagogues, therapists and anyone interested in playing with glove puppets. In addition to the introductory workshops there are also advanced courses on offer. Nursery, Primary and Secondary schools, and other educational institutions working with children or training for work with children can book internal training/days of study. In general they take place in the facilities of the respective institution. The size of groups, the duration and particular contents of the course can be agreed on individually. Please ask me for further details! `All of a sudden I ceased to exist.